Source: BEA in exchange for an honest review. A must read for any Game of Thrones fan or for lovers of historical fantasy adventure novels. Throne of Glass has it all: a teenage assassin, a compelling love triangle, court intrigue, pretty dresses, grisly deaths, intense action - even puppies! Celaena is a seventeen year old and the most feared assassin in the land. Even when half dead in prison, she easily killed 24 grown men in an escape attempt. Now she's been selected to be the king's "champion" in a twisted, fight-to-the-death game. Celaena starts out as a mystery to the reader and other characters alike, but soon reveals herself to be a decent person despite the skill at killing. She comes off as a little arrogant, but it's more that she is very smart and talented and knows it. She also puts up a hard front to hide the scared girl inside of her. I loved seeing her Cinderella turn from filthy slave to beautiful court lady. But not to worry, Celaena is smart enough not to let gorgeous gowns distract her a fight. Then there are our two love interests: Captain Chaol Westfall and Prince Dorian. Chaol is Celaena's guard and trainer. He is practical, no-nonsense, and keeps his emotions hidden away. Prince Dorian is confident, snide, and eager to distinguish himself from his jerk father. This is a love triangle done well. Each develops a strong, independent relationship with Celaena that is based in respect and friendship. There's no insta-love or even insta-chemistry. The characters go through the realistic process of getting to know one another. In what is my test for a good love triangle, I can't decide which guy I'd rather have Celaena end up with. The championship is the adventure portion of the novel. It's set over 3 months, so there is plenty of time for Celaena to become familiar with the castle, court, and her opponents. The competition is more of a test of skills than a gladiator-type battle, although that shows up too. It should be simple until champions start dying. Not just dying, but being bludgeoned to death. Now the reader is glued to the pages not only to see how Celaena will do in her next test, but whether she can figure out who or what is killing her opponents. It turns out there's a magical/paranormal twist, one that will likely be more significant in future books. Throne of Glass gives us a good basis for world-building, but it was incomplete. I know a little about the history, religion, and politics of Adarlan as well as the magical twist, but not enough. Similarly, I learn the basic about Celaena's early years and how she became an assassin, but it felt like a mere framework, not a story. I assume that the gaps in the world building will be filled in future books, but it could have been described more fully in this book without slowing the pacing too much. Like many high fantasy novels, the pacing of Throne of Glass drags a bit. The pages turned slowly at times and I never lost myself in the book. However, the pages did keep turning. There was something intoxicating about the story that kept the book in my hand and eager to see who the killer was, who Celaena would end up with, and just generally discovering more about the Adarlan world. Throne of Glass is well-written overall. I liked the use of multiple points of view. At first, it was confusing but seeing the world from different characters rounded out the story. I found Celaena's voice irritating though. I have trouble defining exactly what bothered me. I think it was how her thoughts were written into the prose. There was an overuse of the words "Oh," No," and "So." Like: "Oh, how she adored candy!" and "No, it hadn't been a dream." You could argue that it individualized her voice, but what it mostly did was invoke eye-rolls. Throne of Glass was a thoroughly enjoyable novel. The story moved quickly, came to a solid conclusion, and left me excited to see what the next book holds. Celaena, Chaol, and Dorian enchanted me with the good natures, humor, and talents. The writing and pacing weren't perfect, but didn't drown out the exciting plot and characters. Great review, Alison and I completely agree with you. Trying to decide which guy you were rooting for is HARD! It'll definitely be interesting to see what happens in the sequel! Personally, Chaol had my heart pretty quick. I like Dorian, but princes are a lot more common as an LI then a Captain of the Guard. ;) I couldn't resist him! That doesn't mean he's "right" for Caelena, though. You are correct--that is yet to be seen, which keeps the triangle interesting. I also wanted to say that I think you nailed it, saying the 'voice' thing is personal. I actually loved Caelena's voice for the very reason you didn't care for. Anyway, totally looking forward to the next book. And I think some of those empty parts may be because of the novellas, which is something I found rather annoying. Ah well... you win a few, you lose a few. I just hope books don't follow video games down the slippery slope of removing important stuff to use it as DLC. That'd be bad. I quite enjoyed this book just . . . not as much as I wanted to. Still, I hope the sequel offers more development for me, especially with some of the characters and parts of the storyline. But as for the love interests, I too am not sure who to pick over the other. Both have their own charms about them. Anyway, great review! Fantasy is one of my favorite genres, so I think I would like this book! Great review! I've been on the fence about reading this one. I've read lots of negative reviews about it, but your review has me reconsidering. I think I might wait to see if the world building gets a bit clearer in book 2 before I dive into this series. p.s. Very excited to see what you think of Nana! I think I'm the only person in the world that didn't care for this book. I fail at life. *sigh* I think Celaena's arrogance, as you mentioned, was something that put me off her initially, and after that I just couldn't quite get to a place where I truly liked her. By the end I was rooting for her, and I'm definitely going to continue the series to see if she grows on me in book 2:) Lovely review though Alison, I'm so glad you enjoyed it! A lot of people compare this to Throne of Glass. I haven't read either, but I need to. There are 4 prequel novellas -- and while I'm usually not a fan, I loved these (well, I've only read the first 3) and it explains the history and Celaena's training. Worth a read. Great review! Great review Alison! This one is on my reading list for 2013, glad to hear it was worth reading overall. I am ALWAYS attracted to high fantasy so I'll definitely be checking this one out (soon I hope)though I had a feeling it wouldn't be a 'ground-breaking' fantasy read...not so bad when you know what to expect :) Anyways thanks for the honest review! This looks amazing! I love assassin books. I just read Grave Mercy (kinda fell short for me), so hopefully this one is better. Great review! YAY! So glad you finally read it! Loved this book. It different from what I normally read, plus the heroine freaking rocks! I still need to read this! Very informative review, although I've already read and loved all the prequel novellas. Still, I want to see what actually happens in the novel. This one wasn't a fave but I liked the idea and can see it developing even more in the next book, along with the worldbuilding. I usually like a bit more background but there's so much that can happen in the next story, I'm looking forward to reading it! I'm still debating whether to read this one or not. I'm glad to hear you enjoyed it, but you're definitely not the first person I've heard say that Celaena was irritating! The rest of it sounds like a fun story, though! Great review, Alison! I Have been trying to get to this book for a while. Great review. I am hoping to get it off my TBR soon. I really enjoyed this too. I'm also torn about which guy I want her with. This was one triangle I was okay with. I do want to see more of this world though! I do not remember the puppies, much to my dismay because cute puppies make everything better! 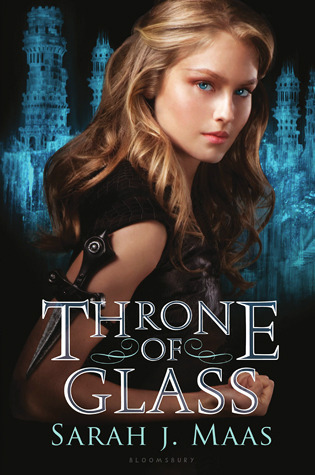 Ah Throne of Glass was one of my favourite fantasy reads of 2012! I read this a while ago so I can't remember if I liked the pace or not but I think I liked how a lot of things were left shrouded in mystery - keeps me guessing and on my toes for book 2! I have this but I haven't read it yet! Great review and I am looking forward to getting to this book! Hmm. I struggle with high fantasy for the very reason that I can't get through all the world-building. But this one sounds SO good. I may have to give it a shot. I'm really looking forward to reading this book - everyone seems to love it! I don't actually read much fantasy anymore but I really want to give Throne Of Glass a go. Celaena's voice does sound a little irritating...hopefully it won't bother me too much, though! I so want to read this book I have for sometime know. Thanks so much for a wonderful review. I want to read this even more now! I hate when there's not a lot of world building especially in this genre, but I'm glad you enjoyed it regardless. Great review! Yeah, this one was SUCH a fun and enjoyable read! It really did seem to have it all! Some of the characters, like Celaena, took a while to grow on me, but I ended up really loving them in the end! Such a fun start to the series - can't wait to see where it'll go. This book is EVERYWHERE lol. I have a thing for female assassins and thieves too.. so I will probably pick it up.